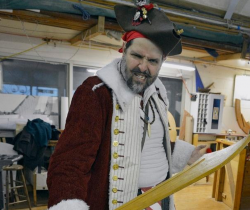 Join Independence Seaport Museum (ISM) on Saturday, February 16, from 10:00 a.m. through 11:00 a.m., when Cubby the Pirate will battle the Franklin Institute's Viking. Spanning one day, follow this showdown as Pirate and Viking duel on two different battlefields, looking to claim once and for all seafaring supremacy! We will be handing out free eye patches, holding a pirate pep rally, making pirate swords and battle rattles during round 1 of this epic feud will commence at 10:30 a.m. at ISM. At 11:25 a.m., the combatants will be making their way to the Franklin Institute via the Big Bus. Round 2 will commence at 1:30 p.m. at the Franklin Institute. Come out and show your ISM pirate spirit!